NORTH MANKATO, MN (MARCH 6, 2018) – Taylor Communications through its Bloomington, Ill. facility, has been named a winner of the 2018 Best of Print & Digital Awards which are focused on customer loyalty. They are given annually by Butler Street Research. Taylor Communications is one of the largest full-service direct marketing providers and a leader in developing and producing highly personalized communications. 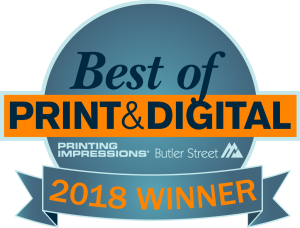 The Best of Print & Digital® is an annual program that identifies which companies have provided the highest service delivery to their customers during the last year through independent customer survey research performed by Butler Street Research for the print and digital industry. This marks the third year in a row for winning this prestigious award. The program uses the Net Promoter Score© (NPS) methodology, a leading indicator of client retention and future growth. This methodology focuses on client loyalty, not just satisfaction to measure the customer experience with an organization. The feedback on economic and emotional value clarifies the quality of the relationships and provides insights to identify client risk and uncover opportunities to introduce innovation to deliver on customer needs and wants, today and in the future. The program is considered the industry standard for measuring customer loyalty. Only the very top companies in the industry are able to achieve this distinction.